A centre forward with great pace and power, Adeola (Ade) Oluwatoyin Akinbiyi was always a popular player at Turf Moor. An English born (Hackney) player, of Nigerian descent, Akinbiyi has had an eventful career in the game, involving spells at many different clubs throughout the country and transfer fees, exceeding fifteen million pounds. Following a successful progression through Norwich City's youth team, Ade made his professional debut for the Canaries in a UEFA Cup, second round tie against German giants Bayern Munich. In terms of goals scored, Akinbiyi's career didn't get off to the quickest of starts; he scored just three goals in 51 first team appearances. During his time at Carrow Road, he was loaned to Brighton and Hereford to aid his development, and in these shorts spells he managed to find the net six times. Tony Pulis was quick to recognise Akinbiyi's attributes and £250k was all that was required to lure him to the Priestfield Stadium in the June 1997. During his spell at Gillingham, Ade found the net consistently, scoring 28 goals in 63 league games, an impressive return. His goals, determination and passion for the game quickly generated interest from other clubs. Despite being tipped by many for a move to the Premier League, Akinbiyi's next stop was Ashton Gate, Bristol City, for a fee in excess of one million pounds. Again, Ade was able to find the net regularly, this time scoring 28 goals in 63 appearances; a ratio of just less than one in every two games. Despite his goals, the Robins were relegated at the end of the 1998/99 season and once again, the centre forward became a player that many managers wanted the services of. After receiving interest from a plethora of clubs, Colin Lee's bid of 3.5 million was enough to take Akinbiyi to Wolverhampton Wanderers as a replacement for the out-going Robbie Keane. Ade's career at Wolves was again short lived, but his sixteen goals provided enough bate for Peter Taylor to give him his first real opportunity to lead the line in a Premier League Side. In a highly inflated transfer market, Akinbiyi was signed for Leicester City for five million pounds. Many fans thought that the fee was ridiculous, but Taylor insisted that Ade would prove his worth with the Foxes. Sadly, Akinbiyi had found himself in a struggling side and goals were hard to come by. Following a memorable miss against Liverpool at Filbert Street, the National Press 'went to town' on Peter Taylor, using puns galore to put down his star buy. Taylor was soon sacked and Dave Bassett announced that he would sell Akinbiyi, in order to raise much needed funds to freshen up his under achieving squad. Crystal Palace was the next port of call for Ade, under the management of Trevor Francis. Akinbiyi's spell at Selhurst Park wasn't a fruitful one. Following a few injuries and a lack of fortune in front of goal, Francis made the forward available for a loan move. It was no surprise therefore, that Tony Pulis (now at Stoke City) was the first man in line to take advantage. Following a successful loan spell, Ade joined the Potters on a Bosman-Free. It was at the Britannia Stadium where he became a real fans favourite, scoring 28 times in 66 appearances. In January of 2005 Ade demanded clarification with regards to his future at the club. He didn't get it and clubs began showing interest. It was Steve Cotterill who beat Sheffield United and Wigan Athletic for his signature and Akinbiyi signed a three and a half year contract for the Clarets on February 24th 2005. £600k seemed an awful lot of money to spend at the time, but this was to be a good move for Ade. His Burnley debut was memorable, yet very short. Trailing 1-0 to Mick McCarthy's high flying Sunderland side, Ade was thrown into the action with little over ten minutes remaining. After almost levelling with a good header, Ade was dismissed for violent conduct, just over two and a half minutes after entering the field of play. Following his customary three match ban, Ade had something to prove and he more than did that. He ended the season on a high with a handful of goals and started the next campaign in a similar vein of form. On bonfire night of 2005, Akinbiyi netted a remarkable hat trick for a Burnley side that was reduced to ten men and with an outfield player in goal for 55 minutes of the match at Luton Town. It was a stunning performance from the line leader, yet it once again resulted in outside interest. Cotterill went on record saying that he'd only sell Akinbiyi for 'silly money' and in January 2006, Sheffield United offered money that the Burnley board could not refuse (1.75 million) for a player that had netted an impressive 18 goals in 42 league and cup games for the club. Neil Warnock had got the man that he had wanted eleven months previous and with Ade's contribution, Sheffield United went on to win automatic promotion to the Premiership. Yet again, Ade's chances were limited in the top flight and he was unable to hold down a regular starting position ahead of fellow forwards, Rob Hulse and Danny Webber. As the transfer window opened on January 1st 2007, Burnley fans woke to read the news that Steve Cotterill had re-signed the player that he was very reluctant to let go, for a fee in the region of £750k and on a two and a half year contract. So this is where the next chapter of Ade Akinbiyi's colourful career begins. One thing's for sure, Ade is a popular figure around Turf Moor, both with the fans and in the dressing room. Welcome back to Burnley Ade! Things were never quite the same for Ade in his second spell at Turf Moor. Steve Cotterill had signed a player who had played little football in the year he'd been away and he struggled for fitness. He played regularly during the second half of the 2006/07 season, scoring just twice, but when Robbie Blake was re-signed in the summer of 2007 it was a Gray/Blake partnership that started the season. Ade had to contend with a substitute role and it was only when Gray left in January 2008, by then with Owen Coyle as manager, that he got his place back in the side. He turned in some very good performances, particularly alongside loan signing Andrew Cole, with the most notable being at QPR as we turned round a 2-0 deficit to win 4-2. The 2008/09 season again saw him out in the cold and he made just occasional substitute appearance with only one start, that at Barnsley. The season, however, did see him score his last ever Burnley goal and it was fitting that it proved to be a vital one as we held Chelsea in the Carling Cup at Stamford Bridge before winning on penalties. His last appearance came in the same competition when he came on in the semi-final at home to Spurs as we heartbreakingly went out and by the end of the season he'd left the club to move to America with Houston Dynamo. When he returned to England it was with Notts County where Dave Kevan, who had worked with him at both Stoke and Burnley, was in caretaker charge. He was there for just a few months before being released. He's not played any football since although he came close to joining Newport County during the 2009/10 season but the deal fell through at the last minute. Ade Akinbiyi played for several clubs in his career and was popular at some and not quite so much at others. Certainly he'll be remembered with great affection by the Burnley supporters, particularly for that first half of the 2005/06 season, and who can ever forget Luton? 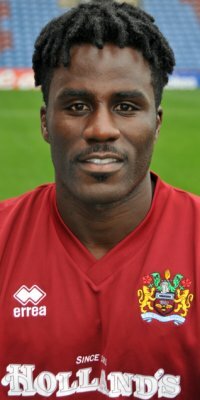 In July 2013 Ade joined Colwyn Bay as player/coach, managed by former Burnley team mate Frank Sinclair. He continued in that role until January 2015 when both he and Sinclair resigned after a 5-0 defeat at Boston. Ade was an unused substitute for that game.